It was only the second time in my life in Spain that I had felt like a foreign foreigner in my adopted country. Being English, I am painfully aware of my roots and that I will never be able to blend in, but I speak the language, am ingratiated into the culture and live like a local. It is only in certain places in the Basque Country that I feel slightly off, a cultural misstep. I had felt it in Markina-Xemein and I felt it in Oñati. I felt like I was in a Basque place, not a Spanish place. 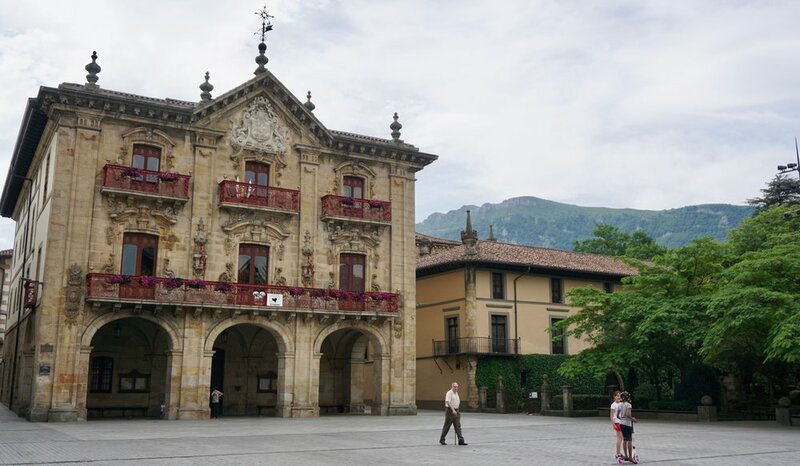 Like Guernica, Oñati felt more tied to the spirit and concept of Euskadi than the big cities or the fishing villages. Maybe because it was isolated and protected and old. Many of the buildings were five hundred years old and hewn from stone. 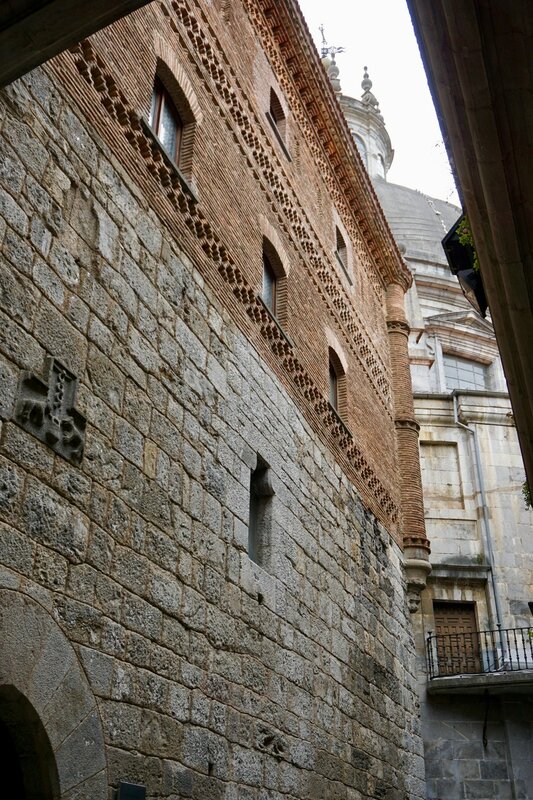 The first university in the Basque Country was Oñati. We took strong dusty coffees in the main square, overlooked by its postcard-ready town hall. Old couples were having their pre-lunch paseo or sitting under the church arches and just observing. Children ran about while parents barely looked on, taking mid-morning beers and cafe con leches: the two Spanish traits of ‘the kids are safe to play’ and ‘there is nothing more important than sitting and talking together’. Everyone knew everyone. I couldn’t stick out more. We strolled around a while and then, having had our fill of surprisingly grand 15th and 16th century palaces and monasteries, decided to take the car to somewhere even more ridiculous: the Santuario de Loyola. A brief stop, but a worthy one. 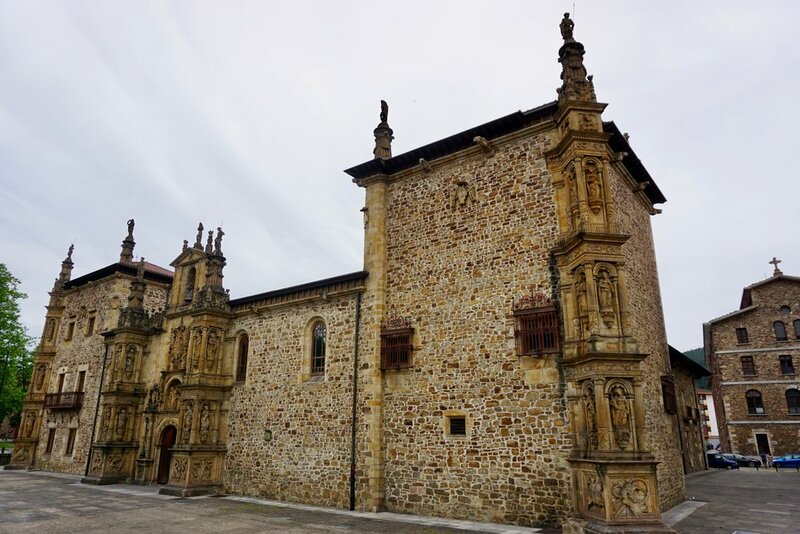 The Loyola Sanctuary sits in the middle of a small valley just off the village of Azpeitia. You wouldn’t know there was a village there as the basilica is so vast, like Escorial north of Madrid, that the eye can’t look away. The birthplace of San Ignacio de Loyola, or Ignazio Loiolakoa if you want a tongue twister, it became a site of veneration after his death. In the 17th century his house was given to the subtly named Society of Jesus. On and around that house they built the overblown building of today. A not so humble Churrigueresque/Baroque behemoth that stands as testament to the power of myths and fables. On the way out of the mountains, they were starting to feel claustrophobic, back to Logroño, we passed through Idiazabal, which gives its name to a smoky sheep’s cheese, and enjoyed a pitstop in the far-flung village of Segura. It was an odd village, objectively tiny and cute, but devoid of people but for a handful of parents and children at the bunting-covered main square. 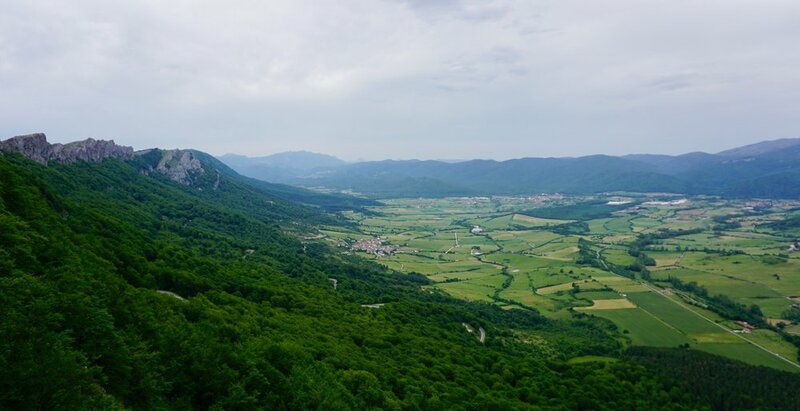 Essentially comprised of three streets running in parallel across an oval ridge with views out both sides to, as per usual in the Basque Country, hilltops, Segura still had things to offer for the curious visitor. The two principal pedestrianised streets were attractive, crisscrossed with wooden beams and oak balconies and textured with plant pots. Many of the small connected houses still bear coats of arms from the illustrious medieval inhabitants of centuries past. Every other door had a dried, dead sunflower nailed to it. The Basques, an ancient people, have traditions that predate simple Christianity. From prehistoric times the sun has commanded respect and rites, and this is no different for the Basques. The sunflower - ekilore - highlights ancient beliefs more rooted in nature than a guy on a cross. The NA-120 road then proceeded to make our eyes water with its views: a dramatic, lime-green valley dotted with ruddy villages and surrounded by ridges that looked as if they had been swept up by an ice-cream scoop. And then to the lonely and beautiful bulk of the Iranzu Monastery. A sandstone-coloured complex lying at the bottom of a rocky green hill, Iranzu has been a Cistercian giant since the 12th century. We chose not to go in. 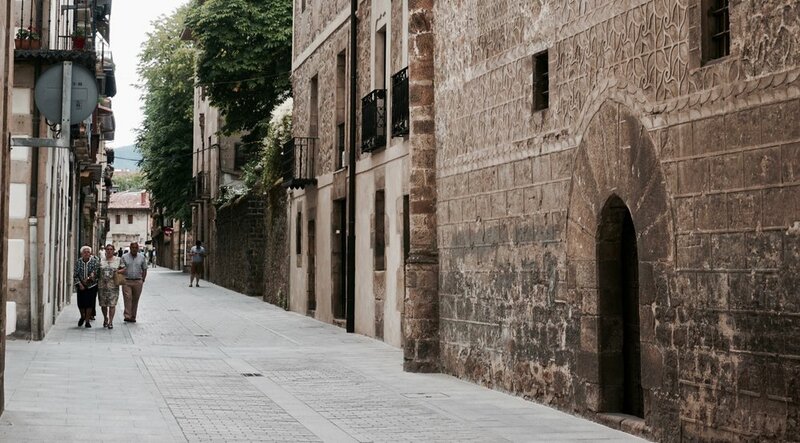 Our brains were hurting from all the history and beauty and so the last stop were the bars of Logroño; but they are for another time.